For the 1958 film, see Houseboat (film). Houseboat Cornelia in Ystad, Sweden, 2018. A houseboat (different from boathouse, which is a shed for storing boats) is a boat that has been designed or modified to be used primarily as a home. Some houseboats are not motorized, because they are usually moored, kept stationary at a fixed point and often tethered to land to provide utilities. However, many are capable of operation under their own power. 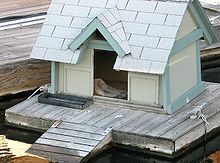 Float house is a Canadian and American term for a house on a float (raft); a rough house may be called a shanty boat. In Western countries, houseboats tend to be either owned privately or rented out to holiday-goers, and on some canals in Europe, people dwell in houseboats all year round. Examples of this include, but are not limited to, Amsterdam, London, and Paris. In Zimbabwe, specifically on Lake Kariba, houseboats have been in use since the creation of the lake in the late 1950s/early 1960s. A houseboat makes it easy to experience the Zambezi basin and all the associated wildlife, as a lot of game come down to the water for drinking and to cool down. There is a houseboat and fishing community on the southern side of Hong Kong Island known as Aberdeen floating village. There was also one such community in the Yau Ma Tei Typhoon Shelter. In India, houseboats as accommodation for tourists are common on the backwaters of Kerala, see below, and on the Dal Lake near Srinagar in Jammu and Kashmir. Houseboats in Kerala, south India, are huge, slow-moving barges used for leisure trips. They are a reworked model of Kettuvallams (in the Malayalam language, Kettu means "tied with ropes", and vallam means "boat"), which, in earlier times, were used to carry rice and spices from Kuttanad to the Kochi port. 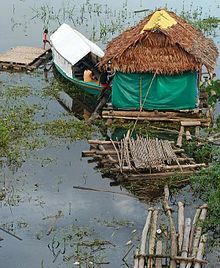 Kerala houseboats were considered a convenient means of transportation. The popularity of Kettuvallams has returned in the function as major tourist attractions. 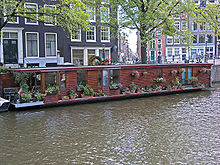 Such a houseboat is about 60 to 70 feet (18 to 21 m) long and about 15 feet (4.6 m) wide at the middle. The hull is made of wooden planks that are held together by ropes of coconut fiber; the usual wood is 'Anjali'. The roof is made of bamboo poles and palm leaves. The exterior of the boat is painted with protective coats of cashew nut oil. House boats on Nageen Lake, Srinagar, Jammu & Kashmir, India. Unlike their counterparts in Kerala, the houseboats in Srinagar, Jammu & Kashmir are usually stationary. They are usually moored at the edges of the Dal Lake and Nageen lakes. Some of the houseboats there were built in the early 1900s, and are still being rented out to tourists. These houseboats are made of wood and usually have intricately carved wood paneling. The houseboats are of different sizes, some having up to three bedrooms apart from a living room and kitchen. Many tourists are attracted to Srinagar by the charm of staying on a houseboat, which provides the unique experience of living on the water in a cedar-paneled elegant bedroom, with all the conveniences of a luxury hotel. Srinagar's thousand or so houseboats are moored along sections of the Dal and Nagin Lakes and the Jhelum River, each decorated fancifully and named romantically and even whimsically. Like hotels, houseboats vary in degree of luxury and have been accordingly graded by the Department of Tourism. A luxury houseboat, like a luxury hotel, has fine furniture, good carpets and modern bathroom fittings, while the 'D category' (the lowest category) of houseboats, like low-budget hotels, is spartanly furnished. Like hotels too, houseboats vary widely in their locations. Some overlook the main road, others look out onto lotus gardens and others face tiny local markets and villages, which are also floating on the lake. All houseboats, regardless of category, have highly personalized service. Not only is there always a "houseboy" for every boat, but the owner and his family are often close by. The cost per day of hiring a houseboat includes all meals and free rides from the houseboat to the nearest jetty and back, as no houseboat on the lakes is directly accessible from the banks. Every standard houseboat provides a balcony in the front, a lounge, dining room, pantry and three or more bedrooms with attached bathrooms. All houseboats not moored to the bank of the river or lakes provide a shikara as a free service from the houseboat to the nearest Ghat (jetty). Virtually every houseboat in Srinagar has been provided with a municipal water connection. In Laos, houseboats are used to accommodate tourists on the Mekong river. The houseboats are usually referred to as 'slow boats' and exist in wooden or steel variants. The Port of Hamburg has a sizable water borne community that includes a Flussschifferkirche or Boatman's Church. Berlin also has some houseboat neighborhoods, notably on the Landwehrkanal in Friedrichshain-Kreuzberg. In Europe, some of the finest and costliest examples of houseboats can be seen along the canals of Amsterdam, which even has houseboat hotels. Houseboats are very expensive in Amsterdam because of the limited number of moorings; this expense has reduced the likelihood that the approximately 2,400 families that live on the inner waters of Amsterdam will find themselves confronted by new neighbor boats. The Bloemenmarkt is a houseboat borne flower market along the Singel in Amsterdam. 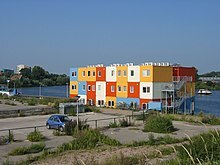 The town of Maasbommel is pioneering floating houses, with flexible connections for fluids and electricity; these are not primarily intended for travel, but rather to be safe against flooding. Houseboats are popular for recreation, dining and clubbing in Serbia. They can be seen in large numbers in Belgrade on the banks of the Danube and Sava rivers, and on river islands. In the United Kingdom, canal narrowboats are used as homes and also as mobile, rented, holiday accommodation. Narrowboats were originally used for bulk transport of raw materials and fuel on canals constructed at the start of the Industrial revolution. Nowadays, the canal network is mainly used for recreation and is different from typical holiday locations, which are usually based in coastal or rural areas, because canals are inland and often pass through many former historical, industrial, urban areas. Over 15,000 people live afloat in Great Britain. Research has shown that liveaboards are not a subculture; actually, they are a very diverse group. Often, they have a strong sense of their local community and its environment. There are a number of residential houseboats/moorings in the London Port Health Authority (LPHA) District. Although a significant number of houseboats are permanent floating residences, many are occupied only at weekends and seldom move whilst others may periodically leave the moorings for short cruises. The various moorings stretch from Broadness Creek and Benfleet Creek in the lower part of the London Port Health Authority District up to Twickenham in the upper part. Many of these are Port of London Authority (PLA) licensed moorings which also have Riparian Local Authority planning approval for their existence, whilst others have neither. In Canada, houseboats are gaining popularity in British Columbia, Ontario, and Quebec as there is an abundance of well-suited rivers and lakes for houseboaters to enjoy. Houseboats in Canada are generally motorised and used recreationally, rather than as a permanent dwelling; this is mainly due to cold winter temperatures and accompanying frozen waterways. The Rideau Canal system is a historic waterway known for its picturesque setting and quaint villages. The town of Sicamous, on Shuswap Lake, British Columbia, is said to be the "Houseboat Capital of the World". Float houses are relatively common along the Pacific coast. A float is a raft, raft-like construction or flat bottom boat. Toronto's Bluffer's Park is home to a small float home community with 24 properties within the park's marina. The homes in Toronto are built on concrete barges chained to the lake bottom and docked at the marina to allow residence year round. These homes have no motor and thus are not vessels. Yellowknife NWT has a small community of houseboats anchored in Yellowknife bay. They are known for their wide variety of colors and architecture, and for being a green community. Seattle houseboat prominently featured in the film Sleepless in Seattle. Seattle is home to a relatively large collection of houseboats (capable of moving under their own power) or "floating homes" (houses built on floats) in several neighborhoods, particularly in Lake Union and Portage Bay. These began to appear soon after the time of first European settlement. At their peak in the first half of the 20th century, there were over 2,500 such homes in the city, not even counting seaworthy live-aboard boats. From the first, they included floating slums of shabby shacks, but gentrified houseboats go back at least to 1888 when the Yesler Way cable car reached Leschi on Lake Washington and a string of luxury summer getaways (none of them surviving today) lined the shore from there north to Madison Park. As of 2010[update], there were about 480 floating homes on Lake Union and a lesser number elsewhere in the city. Most houseboats are designed and built for inland lakes and waterways only. Portland, Oregon also has many houseboats along both the Willamette River and the Columbia River, with the neighborhood of Hayden Island as a prominent example. Float houses are mostly used on the Pacific coast. Renting houseboats has also become popular. In addition, houseboats have been used for commerce; on the Northern Neck of Virginia, Chesapeake National Bank had a floating bank branch called the Boat 'n Bank that provided bank services to watermen. Halibut Cove, Alaska has one of the only floating post offices in the US. Mystic Island, New Jersey had a 'botel' (hotel for boaters with water access) when it started in the 1960s but the building has since changed ownership and no longer operates as such. Sausalito, California, also has one of the most noted collections of float homes that were owned at various times by the likes of famous musicians, film stars, authors, and other notables, from the hippie era until even today. Nearby Belvedere's houseboats date to the late 1800s, and houseboats in the area were homes to railway men shipping logs to San Francisco via the ferry at Sausalito. Like many areas where float homes have taken hold, battles have brewed between float home owners, local and state government, and the local establishment (which includes land-based home owners). Float home owners had fought established land-based tax schemes whereby float home owners sought relief from real estate taxes. The state won the battle with the shadow tax allowing the state to make the case that property beneath the float home was improved by the shadow the float home cast upon the bottom. Houseboating is a very popular recreational activity for groups of people of all ages, aboard houseboats of all varieties, ranging from more modest 30–40 foot boats to 70-foot (21 m)-plus luxury houseboat models. Houseboating is appealing due to the ability to more completely explore the local scenery, remain in close proximity to other outdoor activities (hiking, boating, beaches, etc. ), and finally, retain the potential to move the living quarters for a change of view or neighbors, on a whim. Recreational houseboating in the United States started in the late 1940s when people were looking to stay on the water for longer periods of time. Lake Cumberland in Kentucky is considered the birthplace of houseboating in the USA. 80% of America's manufactured houseboats are in the counties surrounding Lake Cumberland. Kentucky has more lake-style houseboats than any other place in the world. Monticello, Kentucky is known as the "Houseboat Capital of the World." Today one can find motorized houseboats with over 2,000 sq ft (200 m2) of living space. Houseboating on Lake Powell is a popular vacation option since the Glen Canyon Dam impounds water from the Colorado River to form almost 2,000 miles (3,200 km) of shoreline. Lake Mead, the largest man-made lake in North America, about 30 minutes from Las Vegas, New Bullards Bar Reservoir in the Sierra Nevada foothills about 45 minutes from Nevada City, California, and Lake Shasta in the mountains just outside Redding, California, are also popular spots for houseboats. Four rivers or "arms" merge to create this: the Sacramento, McCloud, Squaw Creek, and Pit. Shasta Dam, the highest center spillway dam in the world, can be found at the southwest corner of the lake. Lake Shasta Caverns, can only be reached from the lake. Houseboating is also common on Lake Cumberland - often referred to as the Houseboat Manufacturing Capital of the World (as the majority of American-built houseboats are manufactured in the counties surrounding Lake Cumberland). Lake Cumberland and other lakes in the Southeast US such as Norris Lake (TN), Dale Hollow Lake (KY/TN), Center Hill Lake (TN), Lake Lanier (GA) and more offer very favorable houseboating conditions as the geography provides a vast number of coves and fingers that allow houseboats to tie up or anchor away from the main channel and provides the user a peaceful, secluded atmosphere. Due to the large number of houseboat manufacturers located in the Southeast US, the new and used houseboat marketplace in the Southeast is one of the most competitive and affordable areas for houseboats to be purchased in the nation. Houseboat transporters can also deliver a houseboat to any body of water in the US. Houseboating is also popular on Lake Amistad, Trinity Lake, Lake Mohave and Lake Mead National Recreation Area. In New York, houseboats have also become a major part of the great South Bay on Long Island. Houseboats are also available for rental at Lake Billy Chinook in Central Oregon where waterskiing is popular. Lake Billy Chinook has many little coves to anchor the houseboat. Roughly built float houses are sometimes called shanty boats but may be built on a raft or hull. In historic logging operations workmen sometimes used an ark as mobile dwellings. In Australia, especially on the Murray River and the sunny coastline of Victoria there are many motorized, pontoon-based houseboats with two or more bedrooms; some of these houseboats have more than one level or multiple stories (floors). Some are privately owned as either a primary residence or a holiday shack. Many are also available for hire (rent) as self-driven holiday destinations with accommodation for four to perhaps a dozen persons. Coomera River, the Great Sandy Straits (near the world's largest sand island - Fraser Island) and, in recent times, the Tweed River (near Barri Island during the popular Tournament Crabbing competitions) are especially popular with Queenslanders and interstate tourists. Lake Eildon in Victoria, and the Hawkesbury River near Sydney in New South Wales are popular houseboating areas. In New Zealand houseboating is developing as a holiday activity. Whangaroa Harbour on Northland's east coast is a land locked harbour that provides houseboating. In Maracaibo, Venezuela, there is a big house called La Casa Barco, which was built by a former captain of the Venezuelan Navy in the 20th century. The building resembles a real ship with its anchors, lifeboats, and radars, floating on water. It is located in the neighborhood La Estrella. Nowadays La Casa Barco has become a city icon for tourists. Many houseboats use gasoline-powered generators. The carbon monoxide (CO) exhaust from these generators has caused problems for some houseboat inhabitants. The US National Institute for Occupational Safety and Health, in tandem with the US National Park Service and the U.S. Coast Guard, performed a number of evaluations on air quality, particularly carbon monoxide levels, on houseboats beginning in August 2000. Since that initial investigation, over 600 boating-related poisonings in the United States have been identified with over 100 of these poisonings resulting in death. Over 250 of the poisonings occurred on houseboats, with more than 200 of these poisonings attributed to generator exhaust alone. Some houseboat and generator manufacturers have begun working with these agencies to evaluate engineering controls to reduce CO concentrations in occupied areas on houseboats. ^ Parry, M. H. (2000). Aak to Zumbra: a dictionary of the world's watercraft. Newport News, VA: Mariners' Museum. pp. 215–216. ISBN 0917376463. ^ Gabor, M. (1979). Houseboats from Floating Places to Humble Dwellings - a glowing tribute to a growing lifetsyle. Toronto: Ballantine Books. ^ Amphibious Houses.Dutch Answer to Flooding: Build Houses that Swim. Spiegel Online International 09/26/2005 http://www.spiegel.de/international/spiegel/0,1518,377050,00.html accessed 27 October 2011. ^ Oxford English Dictionary Second Edition on CD-ROM (v. 4.0), Oxford University Press 2009, Float 7A, 7b. ^ "Living the life aquatic in Bluffer's Park - Toronto Star". Retrieved 31 May 2016. ^ "Toronto Float Homes". Retrieved 31 May 2016. ^ "Houseboats | Spectacular Northwest Territories". spectacularnwt.com. Retrieved 2018-04-15. ^ Peter Blecha (August 12, 2010). "Seattle's Historic Houseboats". HistoryLink.org. Retrieved 2015-12-06. ^ "California Revenue and Taxation Code Section 229". onecle.com. Retrieved 31 May 2013. ^ "Whangaroa, Northland, New Zealand - sister to the Bay of Islands". Retrieved 31 May 2016. ^ Carbon Monoxide Dangers in Boating. National Institute for Occupational Safety and Health. Retrieved 17 December 2008. 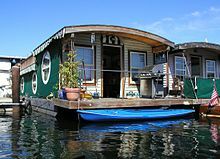 Wikimedia Commons has media related to Houseboats. "The Case of the Hospitable Houseboat." Popular Science, July 1969, pp. 50–55.